It's been barely four months since we saw Xiaomi launch the Redmi Note 6 Pro in India, but the company hadn't done enough with it to dominate the budget segment in 2018. Hence, just over a month after debuting the Redmi Note 7 in China, the company's brought not one but two new phones to the market. There's the Redmi Note 7 and the Redmi Note 7 Pro, quite like how things were a year back when Xiaomi launched the Redmi Note 5 and the Note 5 Pro in India. What distinguishes the two phones is that the Pro variant gets an upgrade in terms of the processor, as well as the cameras. Barring these two specifics, almost everything about the two phones is almost identical. As far as pricing goes, the Redmi Note 7 starts at Rs 9,999 for the variant with 3 GB RAM/ 32 GB storage, while a higher specced variant with 4 GB RAM/ 64 GB storage comes in at Rs 11,999. 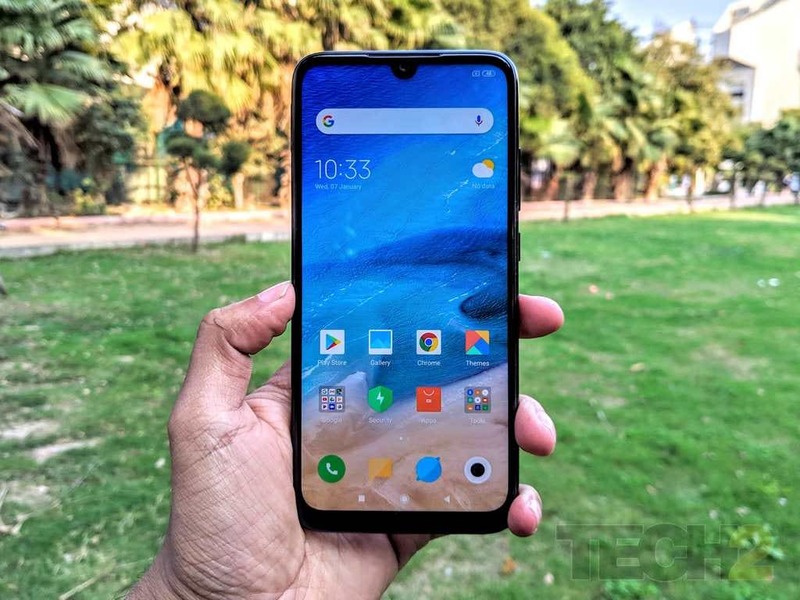 Similarly, the Redmi Note 7 Pro starts at Rs 13,999 for the variant with 4 GB RAM/ 64 GB of storage, while a 6 GB RAM version with 128 GB of internal storage has been priced at Rs 16,999. I've spent a couple of hours using the Redmi Note 7 Pro and here are my two cents on how different this budget powerhouse feels from previous Note series offerings by Xiaomi. While the RN7Pro oozes freshness across the board, the design is clearly the most striking change here. We’ve been pleading Xiaomi to change things up and the company has delivered. In short, if you’ve used or seen any of the previous iterations of the Redmi Note series, the RN7Pro from a design approach looks drastically different. The Note 7 series features what Xiaomi calls its 'Aura' design approach which results in both the phones looking much more rounded. The reason behind this is because Xiaomi’s replaced the metal frame with a plastic one and settled for sandwiched glass instead with a polished look. It’s nothing we’ve not seen before in this price range, but the phone certainly punches above its weight when it comes to pure looks. Pick the phone up and you’ll realise that the glass also makes the phone feel dense, which adds to how premium the phone feels. 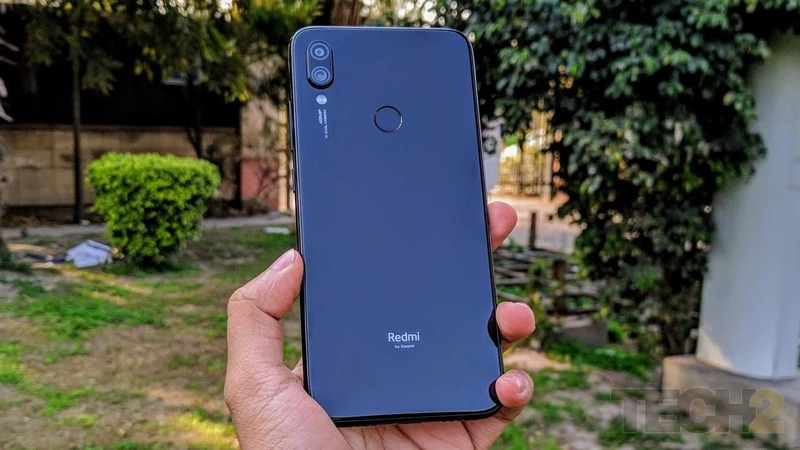 The size of the phone remains the same and is barely 4 grams heavier than the Redmi Note 6 Pro, so the form does feel familiar. 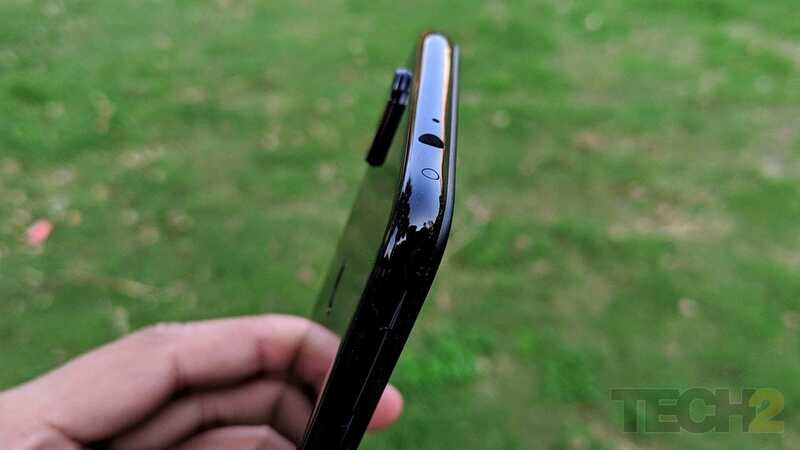 There is a camera bump on the back which could be an issue if you place the phone on a flat surface and the polished glass back does pick up a lot of dust and fingerprints. Xiaomi’s shrunk the notch to what the company likes to call a dot notch. Essentially it’s nothing but a water drop styled notch intended to maximise usable display space. The Redmi Note 7 Pro gets a 6.3-inch LTPS LCD display which happens to be ever so slightly larger (0.03-inches) than its predecessor. The smaller notch also means a few more pixels, so the resolution now stands at 1080 x 2340 pixels with an aspect ratio of 19.5:9. Now, the Redmi Note series has always had a good display for the price but the RN7Pro does up the quality a little. Text looks sharp and the experience of watching a couple of YouTube videos was quite pleasurable. I also had no issue reading text messages on the phone under direct sunlight. Overall brightness levels did come across a little less but I will reserve my judgement on that for the full review. The single most disappointment of the Note 6 Pro was Xiaomi’s reluctance to budge from the ageing Snapdragon 636 processor. Xiaomi’s chucked in Qualcomm’s new Snapdragon 675 SoC, which is not only more capable than the Snapdragon 660 chipset but as per Xiaomi’s claims, also manages to trump the superior Snapdragon 710 chipset on benchmarks. While we’re yet to put that claim to test, the new chip will definitely cater better to gamers on a budget of up to Rs 15,000. Running demanding Android titles like PUBG Mobile and Asphalt 9 will reveal to what effect the new chip handles gaming, but overall, given the budget, things do look promising. The unit we received for review features 4 GB RAM and 64 GB of storage but once the phone does go on sale on 13 March, Xiaomi will be offering a variant with 6 GB RAM and double the amount of storage. Storage can be further expanded up to 256 GB via a microSD card, but unlike the Redmi Note 6 Pro, the RN7Pro does not feature a dedicated card slot. Of the 64 GB of onboard storage, you do get roughly 51.6 GB of available storage. Though there are a few apps which can be considered bloatware (DailyHunt, Sharechat, PhonePe, Amazon, Microsoft Word and Excel) although all of them can be uninstalled to make room for more storage. 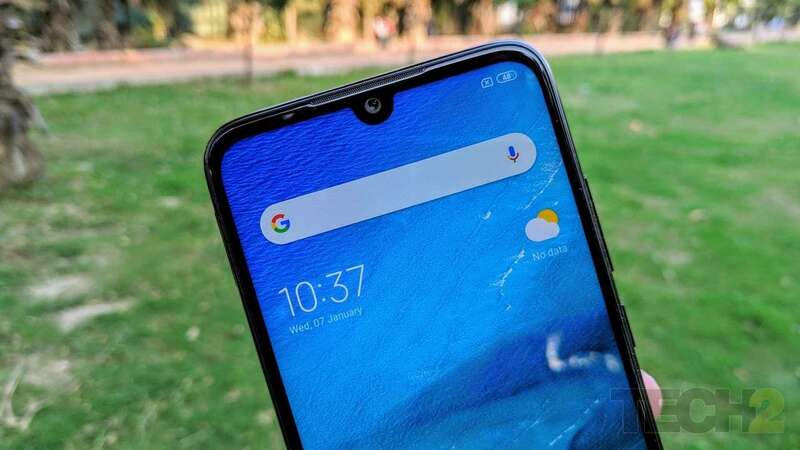 The Redmi Note 7 Pro happens to be the first phone from the Xiaomi stable to run Android Pie-based MIUI 10. What new does that bring? Xiaomi says that there aren’t any visual changes here with Android Pie, but there are plenty of under the hood improvements to improve usability. 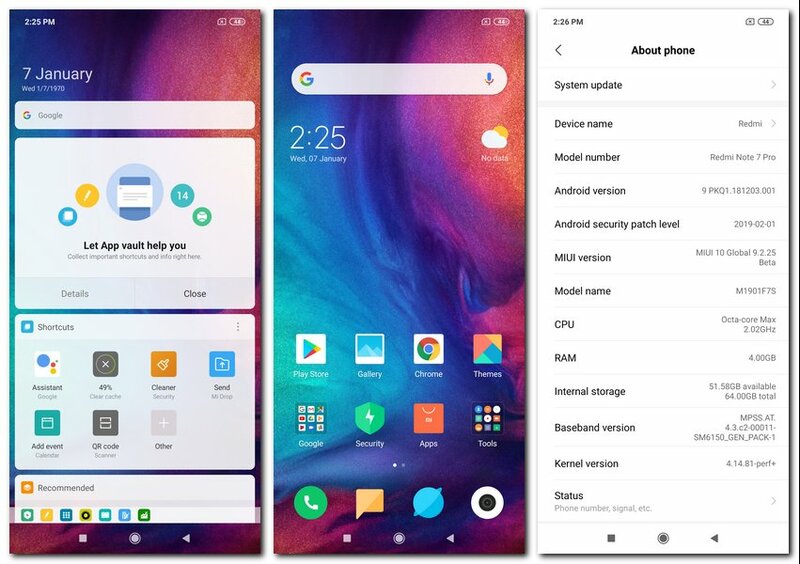 MIUI 10 based on Android 9 Pie on the Redmi Note 7 Pro. In my limited time with the device, I’ve had absolutely no issues on the software end. Xiaomi does usually optimise the software experience on their phones, so I will have to spend a bit more time with the phone to find out if there are any software issues worth mentioning. Xiaomi’s ‘Pro’ branded Note series phones have consistently managed to impress us on previous occasions and Xiaomi intends the RN7PRO to do just that. The camera is the highlight of the phone and the reason behind is the dual-camera setup on the back of the phone. 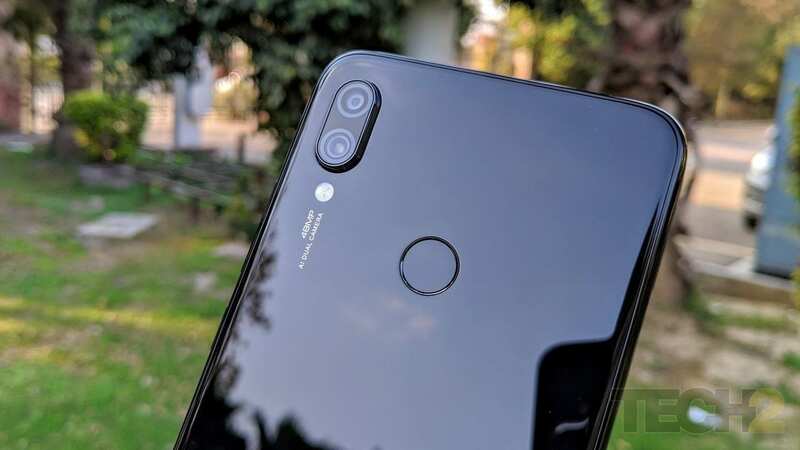 We saw Honor tout it’s 48 MP camera on the Honor View 20 and now it’s Xiaomi’s turn. The Note 7 Pro features a 48 MP f/1.8 primary lens on the back aided by a 5 MP f/2.4 secondary lens. Now, most us know that more megapixels doesn’t necessarily mean better images, but Xiaomi claims that this 48 MP stacked CMOS sensor is half an inch large, which enables it to capture more light than regular sensors. More light hitting the sensor should translate to better sharpness and dynamic range across the board, which Xiaomi believes is best captured on a sensor with 48 MP. This lets users crop into images without any visible loss in quality. However, keeping in mind that 48 MP images do translate to higher file sizes, Xiaomi’s tucked in the option to switch to full 48 MP images only on Pro mode in camera settings. For regular photos, the sensor uses pixel binning to bring the resolution of images down to 12 MP. On the front, the phone features the same 13 MP camera we had on the Redmi 6 Pro. Considering I’ve spent only a couple of hours with the phone so far, my use of the camera has been limited. But do keep a check on our Twitter handle where I will be updating image samples from the camera shot over the next few days. The Redmi Note 7 Pro features a 4,000 mAh battery (which has been a consistent feature on every Note series device till date) and Xiaomi does intend to make the most of the Snapdragon 675 chipset powering the phone. Built on an 11 nm manufacturing process, the phone is expected to offer better battery life, however, I will have to test that out over a longer period to arrive at a conclusion. The chipset also supports Qualcomm’s QuickCharge 4.0 charging standard, support for which has been added on the phone. QC4 rated chargers, though, aren’t readily available in India yet and Xiaomi doesn’t add one in the box either. The Redmi Note 7 Pro is a powerhouse in the reckoning given its price and Xiaomi’s clearly proud of what they’ve been able to achieve here. The aggressive pricing only helps the brand’s dominance in the space, making life even more difficult for competing brands. What remains to be seen though, is if the camera really delivers the good that Xiaomi claims it’s capable of or is it just a gimmick? More importantly, do we really need a 48 MP sensor yet on a budget device? Stay tuned for the detailed review. Meanwhile, head over here to find out how the phone does against the Realme 2 Pro and the Asus ZenFone Max Pro M2.